The police claims to have busted two gangs of vehicle lifters with the arrest of five persons. The gangs were allegedly involved in stealing motorcycles from various parts of the city and its adjoining areas. A Border Security Force constable was allegedly robbed by several miscreants while he was going to Hall Bazaar on a rickshaw on February 11 evening. However, he lodged a complaint yesterday evening. The police has registered a case under Section 394 IPC at the Civil Line police station. As encroachments by shopkeepers on roads alongside Ram Bagh are rampant, commuters have a tough time finding room to walk on the footpaths here. The police has registered a case against several persons for allegedly stealing material worth lakhs of rupees from the construction material of the international check post and selling it to junk dealers at Attari. The police has booked seven persons in an attempt to murder case in which several gun shots were fired at the complainant. Violence on the campuses of educational institutions is an unfortunate reality today. The recent tragedy of shocking shooting at a school premises a few days back shocked us all. The incident also led to the talk of inculcating moral values in schools. Some schools in Amritsar have already gone beyond preaching. Making spiritual learning a part of their school curriculum, these schools have made sure that the already confused teenager doesn't loose his or her mind. Devotees thronged temples of Lord Shiva to pay obeisance on the festival of Mahashivratri, which celebrates the marriage of Lord Shiva with goddess Parvati. The festival was celebrated with religious fervour in city. City students, pursuing aviation courses, got a rare opportunity to experience the working at local airport after the Airport Authority of India’s permission. Navpreet Kaur, a second year BBA aviation student, never dreamt of getting a chance to work at the Amritsar Airport before the concluding of her course. She turned recipes of her grandma and mother good to enter the menu of a Michelin star restaurant, her kitchen into a professional ground to cut through a tough competition. 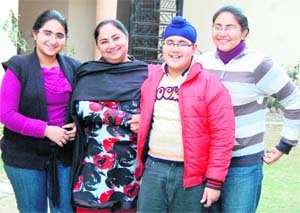 Meet Jyoti Kapoor, now famous as Jyoti aunty of the just concluded second season of Master Chef India. Delhi Public School bagged the overall trophy. DPS skaters won 13 medals collecting 45 points 8th inter-school roller skating competition held at Delhi Public School here today. Over 100 skaters from 11 schools took part in the event. Students in the 6 to 16 year age group took part in 12 categories. The police claims to have busted two gangs of vehicle lifters with the arrest of five persons. The gangs were allegedly involved in stealing motorcycles from various parts of the city and its adjoining areas. Sadar police arrested Lucky Pata of Friends Avenue and Ashu of Avtar Avenue. The police has also recovered a stolen motorcycle (PB-02-AZ-8975) besides 250 gram of narcotic powder from their possession. A case under Section 379, 411 IPC and the NDPS Act has been registered at Sadar police station in this regard. In another incident, Chhatiwind police, falling under the Amritsar rural police district, has arrested three persons identified as Gurbhej Singh of Dharmkot village, Amandeep Singh of Partap Nagar and Harpreet Singh of Sarai Amanat Khan. The police has also recovered four motorcycles from their possession. DSP (D) Nahar Singh said the accused stole the vehicles from various parts of the city. A case under Section 379, 411, 473 IPC has been registered. The court sent the accused in two-day police remand. The victim has been identified as Sanjiv Dube, a Constable with 80 Battalion of the Border Security Force posted at Khem Karan sector. In his complaint he said on February 11 he was going to the Hall Bazaar on a rickshaw. He alleged the rickshaw puller, however, took him towards Company Bagh on some pretext where someone hit him on his head with some blunt weapon and he fell unconscious. He said when he regained consciousness, he found himself in Guru Nanak Dev Hospital. He said he had Rs 19,000 cash, two gold rings, a gold chain, an ATM card, driving licence and a Nokia make mobile was apparently robbed by unidentified looters. Narinder Singh, SHO Majitha Road police station and the investigating officer said the case was registered on the directions of police commissioner.He said he was found unconscious near the railway line and the GRP forwarded the case to the city police. As encroachments by shopkeepers on roads alongside Ram Bagh are rampant, commuters have a tough time finding room to walk on the footpaths here. From roadside tea vendors to dhabas to cycle and scooter mechanics, almost every shop keeper here contributes to make it difficult for the general public. The road from Ram Bagh Chowk to Jallianwala Bagh Memorial Civil Hospital is full of shops overflowing on to the footpaths. 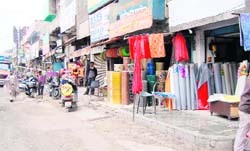 At places the footpaths have entirely been used up by encroachers. Even from Ram Bagh Chowk to the bus stand, the footpaths are being misused by small businessmen. Some even sell clothes on these footpaths by placing folding beds. Jivanjot Singh, a student said, "The space should solely be used for walking and not operating businesses. Commuters are forced to walk amidst the heavy rush of traffic which is not safe at all.” He said these spots are very crowded because of the encroachments. Another resident, Waliati Lal said, “The administration is blind to the problem. A special drive to vacate these footpaths from encroachments must also be initiated by the administration. The parking for scooter and motorcycles on these footpaths is also rampant. Under these parked vehicles, the raised platforms for pedestrians are barely visible. 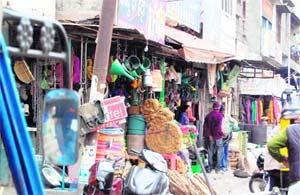 The hardware and furniture shops on the stretch along the chowk, also display their goods as plastic furniture items and other things on the footpaths because of less space inside the shops. He said though a police station is alongside the chowk, they don't seem bothered with whatever is going around. The incident has raised eyebrows as the area is considered as highly sensitive and under the constant watch of various agencies deputed on the border. Acting on a tip off, the police impounded a trolley laden with iron girder and other construction material worth Rs 10 lakh which was being taken to Attari. The accused were nabbed while the trolley was coming out of the check post. The police has arrested the driver of the trolley Hardeep Singh and a junk dealer identified as Tehal Singh. A case has been registered against the accused. The police has also booked several employees of security guards deputed by the construction company, for their alleged involvement in the embezzlement. A probe was initiated under the supervision of Jagjit Singh Walia, DSP Attari. The construction of the ambitious international check post was already delayed for a number of times. It was to be opened on February 13, however, the dates were again postponed as the it was yet to be completed. Sources say that in the initial probe, only the involvement of the security branch has come to light. “In the initial investigations the involvement of employees of RITES company, which was entrusted with the job to construct the ICP, has not been found, but the investigations are on about their role,” sources said. Sources say it was just the tip of the iceberg as the accused may have sold the construction material worth crores by now. The international check post has been under construction for over a year and a half. Several other junk dealers were under watch, he said. Upraj Singh, a resident of Bal Kalan village in his complaint to the police alleged that the accused identified as Tejkaran Singh of Tungpai, Mandeep Singh of Verka, Mehtab Singh of Rajasansi and four other unidentified persons, allegedly followed and intercepted the vehicle in which he and his companions were traveling and fired gunshots with the intention to murder him. He said he along with his cousin, Gurpreet Singh was having soup at B-block market in the posh Ranjit Avenue area here. He said the accused were also present there. He said they had an altercation on a minor issue. He said the accused, who were in SUVs began abusing them. Upraj said to avoid any quarrel, they left the scene. However, the accused who were in SUVs followed them and intercepted their vehicle near Sartaj Hotel on bypass road. While Tejkaran fired at his cousin, Mehtab hit him with a baseball. He said Gurpreet fell unconscious and the accused ran away from the spot. Sohan Singh, SHO Sadar police station said the accused were absconding and raids were being conducted to nab them. He said a case under Section 307, 341, 427, 506, 148, 149 IPC and 25/27/54/59 of the Arms Act and investigations were on, he added. “Everybody is aware of the ups and downs one experiences throughout the growing up years. Children today have all kinds of information at their disposal. You never know what impacts their mind and so spiritual or moral education becomes necessary,” says Neera Sharma, principal, DAV Public School, Lawrence Road. Making sure that her students find comfort and calm, Neera organises havan at school premises every morning. 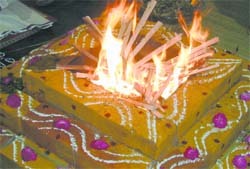 "We perform havan every morning, in which students participate, chanting mantras that keep them calm. We also have moral education as part of the syllabus and plan workshops to teach them activities encouraging hem to lead a good life." The school also holds regular workshops and seminars on spiritual growth and inculcating good values in daily life. “We have visiting spiritual instructors from the Art of Living and Chinmaya Mission performing group activities with students,” she says. Their recent event towards this was about creating a recipe for peace. “It was an activity aimed at involving students to think about finding solutions to eliminate violence. We had a houseful, she said. Acting on similar instincts and create an environment of peaceful learning, Angels Paradise, a pre-school chain has devised a programme, Neev, that teaches students to adopt a spiritual way of life. Every Saturday evening, children between the age group of 4-12 chant mantras from the Vedas, perform kirtan and learn good values by reading religious texts. “It’s an awareness programme for children, designed to make them enjoy and learn at the same time. The development of the mind and soul has become important for them to cope up with the stress of growing up,” says Muskan Kapoor, who runs the programme and is an Art of Living instructor. Students also do yoga for holistic development, she adds. “Kids get mislead very easily, whether it is through informative media or peers. The positive energy they get from reciting shlokas and hymns, helps them bring their aggression and confusion under control,” she said. Connecting them to their culture, keeping their balance of mind, body and soul, spiritual learning has become the best possible solution to the problem of teenage violence. With a good feedback from the parents, it seems to be working. “I take independent classes and workshops in spiritual learning in over 50 schools in the city and I have students who look forward to it. Whether it is academic stress or peer pressure, with an early moral education and guidance, spiritual learning can easily become a part of their routine without having to preach,” she says. 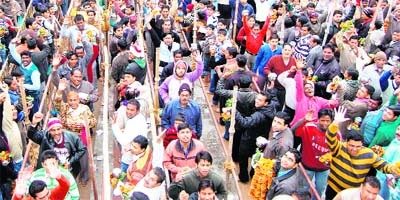 Lakhs of devotees paid obeisance at Veer Bhan Da Shivala, Bhaiyan Da Shivala, Durgiana temple shrine and several others. Long queues of devotees were seen offering milk, water, fruit and other articles at the temples. Among the temples thronged by a large number of devotees, Veer Bhan Da Shivala is revered as one of the oldest in the region, which was constructed during the reign of Maharaja Ranjit Singh. The temple is also known for its beautiful frescos. Devotees also offered a mix of water, honey and milk. Fruits like berries and bananas were also distributed as prasad. Stalls of langar distributing prasad were also set up in various parts of the city. 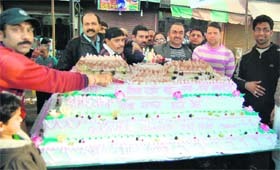 Amarnath Sewa Mandal prepared a 500-pond cake, set up a Punjabi dhaba, fruit stall and also distributed ice cream on the occasion. Sharing her happiness she said working at Sri Guru Ram Das Ji International Airport gave her tremendous exposure. A beaming Navpreet said staff of the AAI and different airlines were courteous enough to share their work experience. Another student pursuing Aviation Hospitality Travel and Tourism course, Vishnu Bhatia (24), said such an exposure to airport working in general and ground handling in particular would be of immense help in their career ahead. He said he got the opportunity to know the working of international airlines and to experience what they have been reading all these years. They learnt the working of international immigration, passport, visa and numerous other departments, he added. Airport Director Sunil Dutti said the students were allowed to conduct a feedback survey of the passengers for a fortnight. He said the need was for only six students and a supervisor. He said a group of two students were allowed at visitors’ gallery, arrival lounge and check-in. He elaborated that the fortnight stay at the airport would allow students to get familiarised with environment. He said the feedback compiled by these students would be considered and suggestions would be taken into consideration to make the airport more passengers friendly. Many city colleges have incorporated aviation departments. Private aviation institutes are also coming up in the city to tap the enthusiasm of students to join aviation industry. Many institutes have set up ultra-modern aviation lab equipped with a public address system. They are offering many postgraduate, graduate diplomas and degrees in the aviation courses. The housewife, whose recipes made her one of the most popular contestants on the show, says has become even better when it comes to her culinary skills. Her resolve is to change the concept of home cooking. The lady from Amritsar, who goes to eat out once in a year or so, had no idea that she will one day become the face of the city’s passion for food. Pushed into auditioning for the show by her husband who she says is a big foodie, she counted herself out even before she began her journey on the show. “There is a lot of heat in Masterchef kitchen, with tough tasks and recipes that we don’t come across in our routine cooking. Not only you have to cook delicious food, but know about each of the ingredients and details that go into presenting it impressively. And you are judged by the best in business,” she says. Belonging to a city which loves its food, added to the responsibility. “People thought Amritsaris enjoy eating and not cooking. I guess I was able to change the perception,” she says. It wasn’t tough for her after all. Having inherited her mother’s culinary skills, Jyoti takes a scientific approach towards cooking. “It’s not an everyday activity; it has a technique to it. On the show, Chef Ajay was the one who had a vast knowledge about food in every possible way.” For Jyoti cooking had always been an outlet for her creativity. She first cooked up a meal for her mother at the age of eight and has been improvising on it since then. “Where my mother left, my mother-in-law picked up. She is even better than me,” she says. She made the judges fall in love with her butter chicken, admired her maiden attempt at tossing up an interesting French delicacy on the show. “Before the show, I was clueless about French cuisine. But the idea is not to be perfect at everything, only to learn and improvise quickly.” Her dignified presence and then elimination on the show made her a darling of Vikas Khanna, who also belongs to the city. She is currently working on his book on famous delicacies from Amritsar. Three girl students who made the school proud were: Zyanapreet Kaur winner of U-10 category; Bhavya Gupta won U-12; Japbir Kaur Virk won U-14. Among boys, Inder Partap Singh won in U-14 and Anmoldeep Singh in U-16 made the school proud. Ryan International School bagged the second position with 19 points and 5 medals while the Millennium School won the third position with 18 points. Former football coach Tasvir Singh inaugurated the event by releasing balloons. Sandeep Gill of Ryan International School won gold in U-8 age group, Sonamjeet Kaur in U-8, Navroop Singh in U-10 categories. From The Millennium School, Suvansh in U-6 and Harshil in U-16 won gold medals. After presenting the prizes to the winners the chief guest motivated the skaters and encouraged schools to initiate such interactions among the students of various schools.